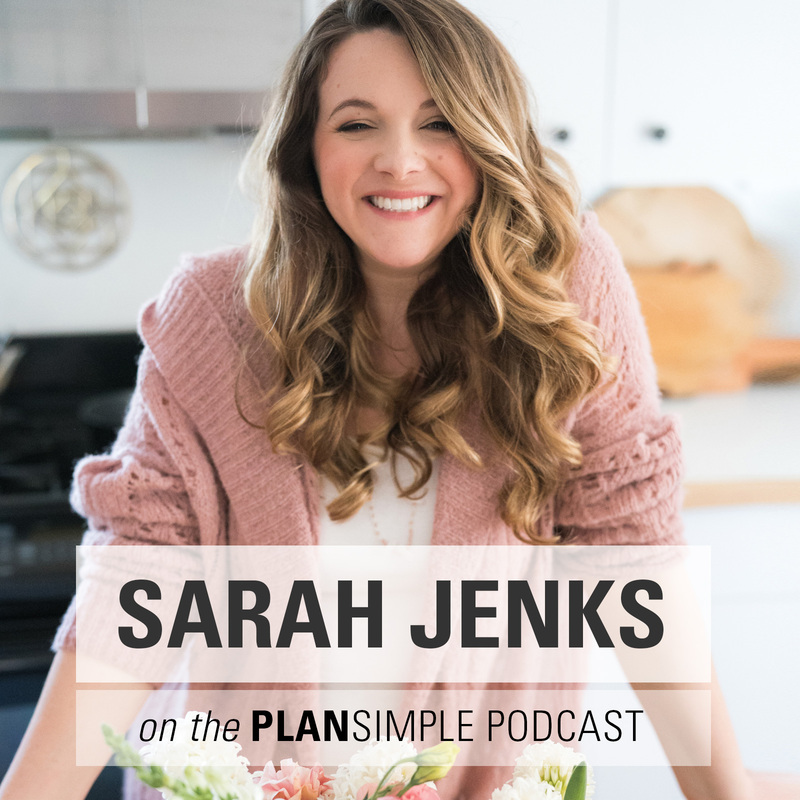 On this episode of the Plan Simple Podcast, I’m so excited to talk with Sarah Jenks. If I have ever met anyone who truly walks her talk, and then turns around and teaches us all the lessons she has learned, it is Sarah. We dive deep into her story which starts with her longtime body image issues and how she finally made her life full of joy. We then move into motherhood where, once again, Sarah;s beliefs of who she thought she could be were tested. Through her struggles, she created some amazing magic tools and healing rituals, so that we too can thrive — and she shares some of them with us! When I first me Sarah, I was drawn to her clarity. 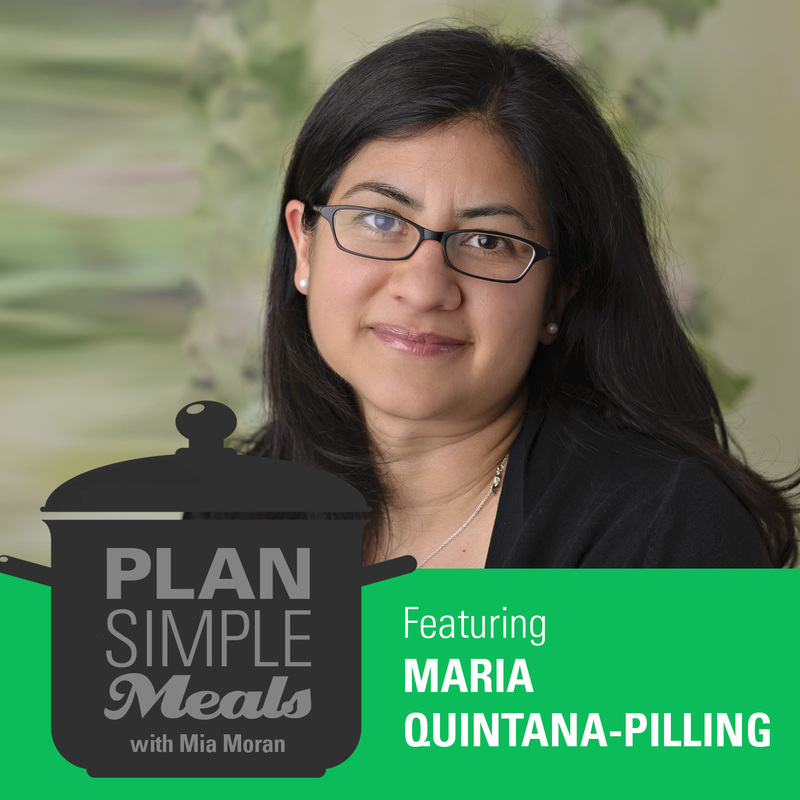 You will hear first-hand on this episode how her quest for clarity has really shaped her life – and what that means for her family, business and us. 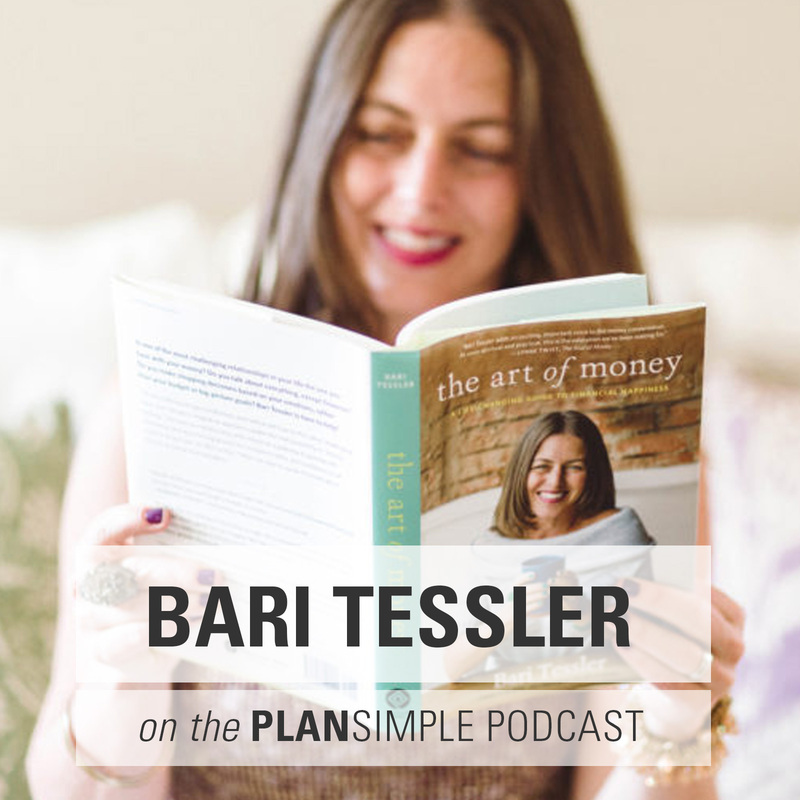 Sarah’s inspirational story of going from being a totally stressed out mom to designing the life of her dreams — yurt and all! Before I had kids, I devoted years of my life to being at peace with my body. 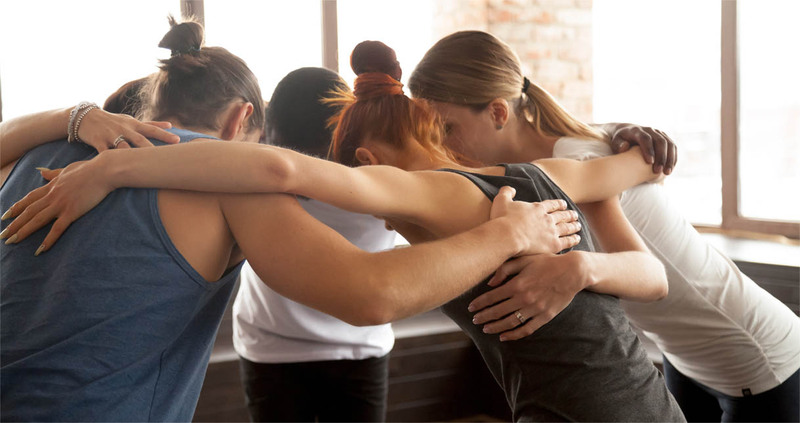 The freedom and joy I experienced birthed my international program Live More Weigh Less, where thousands of women have found freedom from emotional eating and fallen in love with their bodies. Live more weigh less was celebrated in publications such as Forbes , success magazine, health magazine, parenting magazine and Martha Stewart living. But after I had my first child, I felt like all of the freedom, magic, and sparkle of my life and soul were sucked out of me. Being a mother was so all-consuming, and I realized I was falling into the trap that so many women get stuck in. The trap of putting everybody’s happiness before my own. I spent many years in a tireless search for my soul through working with shamans, coaches, spiritual teachers and traveling to many sacred sites. This helped me land in a life that feels like a true expression of who I am. I rarely do things I don’t want to do. I feel fully supported by my husband in our home life. I feel freedom to be the real me with friends, my family, and at the grocery store. I have time for the things that matter most. I have an incredibly deep connection with my kids, my husband, my soul, nature, and the magic that exists in the world around us. Now I’m a stand for women to end the pattern of taking scraps after everyone in their lives has feasted. Through my weekly letter that reaches close to 100k women, real and raw Instagram account or my upcoming free workshop: Lost in the shuffle of your life? How to pull forward your most alive, confident, soulful self (http://sarahjenks.com/freeworkshop), I invite you to step in to creating a life that is a true expression of who you are. Alisa Vitti’s work at floliving.com. GIVE UP GLUTEN AND DAIRY FOR 10 DAYS. Sarah was having a hard time connecting with her intuition and soul and knew that food was part of the solution. Once she got rid of the fog, she felt direct connection. She realized that for her changing her food is a spiritual practice. She used her spiritual practice to support what to her was a huge change in her life. TAKE A DAY OFF. Sarah talks about taking whole days off on a regular basis — a school day where you bath, nap, read. Open your calendar and block out a date. Make it yours and then spend some time feeling into what you would do on that day. Maybe you sleep. Maybe you exercise. Maybe you read a whole book. Maybe you spend a day a museum. Just make sure that it is what your soul really wants to do and not what you or anyone in your life thinks you should do. ADD THE MOON PHASES TO YOUR CALENDAR. Trying to live life by the moon, or your menstrual cycle, can have a huge impact on your sanity! Start by getting the moon phases into your calendar. Use one of the recourses Sarah mentioned to learn more about what that means for your schedule. Honor that cycle for a month and see what happens! REALLY getting healthy as a family can be a big lifestyle change. But no matter how insurmountable it may feel, focusing on one doable change at a time can help you take small steps toward your big goal. A healthy lifestyle is really made of lots of little things that when repeated regularly and added together over time make a huge impact on your life. 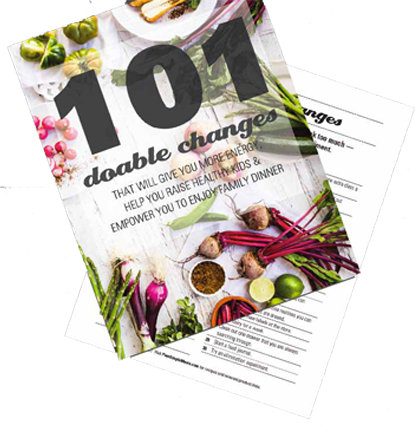 Choose one Doable Change every Sunday night — one thing that you are willing to play with for the week. The key is to keep it doable and fun! Write that thing on a sticky note or your phone so you remember it. Then put 3 things on your calendar that support it.